Iconic Sounds in Super Smash Bros.
Super Smash Bros. for Wii U is coming out this week. While a lot of the fun of the franchise is its sharp gameplay and visual nsotalgia, one thing I find fascinating about Smash Bros. as a celebratory game is the fact that many of the sound effects are taken from the original games. When Mega Man shoots his Arm Cannon, it makes that characteristic pew pew noise. When Mario does his Super Jump Punch, he has that classic “boing” effect. If you know the sounds, they’re pretty nostalgic, and if you don’t, they probably seem as if they come from a bygone era. Smash Bros. is certainly not the only game to do this. In fact it might very well be the Dragon Quest series which does this the most, as the same sounds for spells since the original game are still being used in every sequel. However, what’s interesting is more than just the use of those classic sounds, as there are also clearly decisions to not use those sounds as well. For example, when Charizard uses its Flamethrower, it’s just the sound of fire spewing forth, and not the original Game Boy games’ crackling noise. Its nostalgia, arguably, is not located in that aspect. In contrast, Duck Hunt’s special moves are loaded with audible NES references, whether it’s the sound of a falling duck or a wild gunman shouting, “FIRE!” while garbled by primitive voice digitization. Here, it’s as if Duck Hunt is there to represent the NES Zapper line as a whole, and because the existence of the Zapper is tied to a specific era in video games, most of its sounds have not been updated, unlike Charizard’s. It’s also notable that the Pokemon have their voices from the anime, as it implies that their cartoon is the primary way by which Pokemon characters are associated aurally. Of course it doesn’t mean much for gameplay whether the sound effects are modern or retro, but they do give a lot of flavor to the characters and the game as a whole. It’s easy to get the sense that, ah yes, this is the character I remember from my childhood. Puberty is a funny thing when you’re a fan. In some instances, a female character can enter the mind of a young boy just by virtue of being the most prominent female in his favorite show, and then stay with him as he awakens sexually. Of course it doesn’t happen to every fan, and I’d be remiss to not include female fans who carry the torch for their male childhood crushes (or varying combinations between these two areas), but as a guy who likes girls I want to focus on that area. Feel free to chime in with your own thoughts given your own sexuality. 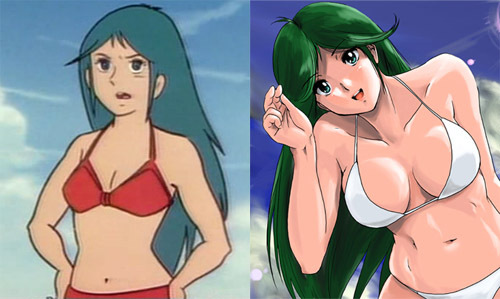 The first examples I can think of are Sayaka from Mazinger Z and Chizuru from Combattler V. While they are obviously not applicable to me seeing as I did not grow up with either show, in Japan and Italy and other parts of the world where these shows found popularity you have a lot of devoted male fans who will sexualize them and possibly draw fanart of them, to the extent that someone unfamiliar with these series might scratch their heads, or perhaps get the wrong impression of them when they see fanart of Chizuru in an outfit that’s quite a bit tighter than canon suggests. This is not a knock on either Sayaka or Chizuru. I can easily see guys liking them for legitimate reasons, and they’re even portrayed as attractive within the contexts of their shows (e.g. shower scenes), but I think there’s more to it than that. An even better example might be video game characters. I’m not talking about your RPG characters who get loads of development, or games that have come out more recently and have the benefit of powerful graphics to improve character design and rendering, but those old, let’s say pre-90’s video games which barely had stories to go with them. While Samus Aran has had a lot of development over the years, guys were finding her hot since the NES era. Obviously her stripping to her skivvies in the ending sequence plays a role in this, but I think what pushes that over the edge is that you play as her for so long that you get attached to her. Again, familiarity. Of course this doesn’t happen with every fan, but being a fan makes this more likely, I think. To preserve the memories of their favorite “stories” from childhood and bring those memories with them through to their teenage years and possibly their adult life, isn’t that the kind of thing a fan does? And then my thoughts lead towards “moe.” Modern moe shows of course don’t have that advantage of familiarity, but when I think about it, liking a video game character because of the two or three things you know about them and liking a moe girl who is a collection of moe traits aren’t that far off. So I wonder if moe in the marketing sense of the word is trying to tap into that same nostalgia reservoir, only through more “efficient” means. I’m not here to judge what characters you like for whatever reason, but to simply put down my thoughts on the way the fan mind works, particularly for when you start thinking girls (or guys) are awfully nice-looking. On another note, I realize my past three post titles have all been song lyrics. Yeah I don’t know either. The second season of K-On! begins with the girls of the light music club heading to their clubroom. 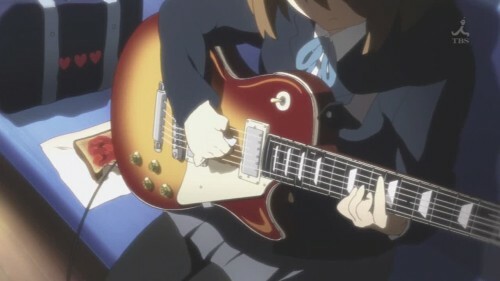 Already there, Yui plays a quiet tune on her guitar evoking a feeling of renewal and change tinged with nostalgia. The subdued nature of this first scene then carries over into the rest of the episode and beyond. As K-On!! has progressed, there has been a distinct overarching focus on the the idea that high school is almost over for the founders of Houkago Tea Time and that things will never be the same. 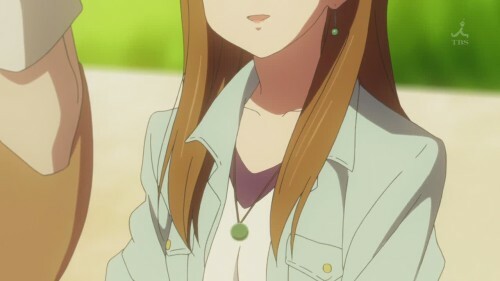 While present to a certain extent in the manga, Kyoto Animation’s adaptation seems to be focused on showing the subtle magic of the senior year of high school, before the girls become adults and get that much closer to the real world. A semi-running gag in the manga about the ex-student council president turning out to be Mio Fan #1 now features that same character as a mature college student looking fondly on her high school memories. An entire episode is devoted to Sawako, the club supervisor and closet former metalhead guitarist, and her recapturing some of the passion of her youth. In general, the lighting in K-On!! is very soft, again hinting at a strong feeling towards the ephemeral. The message from Kyoto Animation is loud and clear. I’m not sure how I feel about this, as I think it’s an attempt to add a bit of depth to K-On!, but I’m not sure how much K-On! needs or even wants it. I understand that high school is a big deal and all. 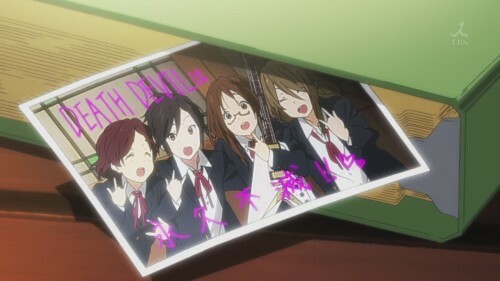 My memories of high school are among my most cherished, and it’s because I had very close friends with whom I could be myself, which is also the case in K-On!! However, because it was only somewhat there in the source material, some of it works, some of it doesn’t, and the end result is that it kind of feels forced in. What are your thoughts on the direction K-On!! has taken? A few days ago, when I wrote about the direction giant robot designs have taken over the years, I received a comment pointing out to me the “Master Grade RX-78-2 Gundam 2.0,” which was a new model kit version of the iconic original Gundam, only designed to more closely resemble the mobile suit as it appeared in anime. When compared to previous RX-78-2 model kits, this means less details, different proportions, and a more “cartoonish” look overall. Then today, I saw the Toy Fair 2010 GI Joe toys. These action figures were designed based on the 80s version of GI Joe, the 3 inch figures instead of the giant doll-like ones. The only thing is, they are much more detailed and gritty than the 80s toys they were based on! It was also made clear that these toys are there partially for GI Joe collectors, adult men who look back fondly on their childhood toys, and I think it is all the more apparent that, like the One Year War RX-78-2, these GI Joes are trying to fill the gap between the actual toy and the collectors’ memories of what the toys were like as children, memories fueled by the power of childhood imagination. And there, in the attempts to make up for the loss of childhood creativity and thinking with skilled craftsmanship, lies the foundation of the nostalgic toy. That is not to say of course that adults are incapable of having strong imaginations. Fiction as a whole would be incredibly boring if that were the case. Nor am I lumping everyone in as wanting more “realism” in their toys, as the original commenter I referred to above was all in favor of more toys like the MG RX-78-2 2.0. Instead, the issue is simply that the mind of an adult is simply different from the mind of a child. I am reminded of this fact whenever I look at drawings from my childhood and compare them to what I have done as an adult or even as a teenager. If you look at the Soul of Chogokin series of toys, you will find everything I’ve been talking about, with its more solid and realistic redesigns of classic mecha targeted towards adult buyers, but if you want to really see what I mean by adults caring about structure, take a look not at the Soul of Chogokin line, but the original-style Chogokin toys, or rather, reviews of them by collectors. You will find that the way the reviewers talk about the features of the toy, about what is good and what is bad, is almost inevitably a very “adult-minded” way of looking at the toy, giving words to topics such as “points of articulation” and what-not. Even when referring to the nostalgia factor this happens, whether the topic is Chogokin, Jumbo Machinders, or Generation 1 Transformers. It’s common knowledge among collectors, but the first generation of Mobile Suit Gundam toys, resembling the “neat gadgets”-style Chogokin toys that preceded it, were a marketing failure, as the toys did not really match up with what was on the screen. It really wasn’t until the concept of the giant robot “model kit” revolutionized giant robot figures that Gundam merchandise became the monster that it still is today, and people claim that this has to do with the fact that the audience for Gundam was skewing older than giant robot shows had in the past. I may be jumping the gun here, but what it looks like to me is that the older audience of younger and older teens were looking for more structure and accuracy in their toys, and that is what they got. As soon as Gundam hit that older demographic, I believe the Chogokin-style toys were dealt a serious blow, even putting aside the shoddy designs and inaccuracies of the original toyline. I think that the attitudes towards the 2.0 MG RX-78-2 are actually an extension of this over time and international waters. Actually, more than even Chogokin reviews, if you really, really want to see the difference between child and adult mindsets and creativity, take a look at the webcomic Axe Cop. Promoted as being written by a 5 year old and drawn by his 29 year old brother, the artist admits to the story not being truly written by his significantly younger sibling, but that he asks the young child questions about the setting and events that occur, and then builds a story around it. The adult adds structure to the boundless imagination of the child, structure that is necessary to keep it all together, even if it doesn’t make sense entirely. But when it comes to reality, the child and adult’s responses reverse. I wouldn’t really call myself a sentai or tokusatsu fan. Of course I grew up with the Power Rangers on TV, though I didn’t keep up with it too well, and even remember denying even watching it (and Sailor Moon). I’m enough of a nerd that I will say “3 3 5” in the middle of a conversation, and I watched episodes of Magiranger when I lived in Japan, but I do not self-identify as a sentai fan. So it’s with that history and mindset that I started watching videos of Super Sentai crossovers. Having little nostalgia for Super Sentai, I find the almost familiar effect these crossovers had on me to be amazing. It doesn’t matter if I didn’t grow up eagerly awaiting the latest crossover every year. The acting and presentation tell me that it doesn’t matter, and that something can feel nostalgic without actually being so. I think the main reason why Super Sentai and other such shows manage to garner their fanbases among even adults has nothing to do with people being unable to grow up, or that they’re using it to live in the past however temporarily. The actors in Super Sentai, be they the actors behind the masks or with the masks off, always show respect for their roles. Respect and talent. Can’t forget that second part, as no matter how much you respect it your Japanese 101 video with you speaking broken Japanese while dressed like a samurai won’t ever amount to much. But respect for the role is more important than talent, just by a little. Being convinced that the characters take whatever it is they do seriously is a recurring theme in anime and manga, and it’s something I’ve found difficult to use as a reason to convince others to watch a show. While fighting anime such as Hokuto no Ken are the most common grounds for this sort of thing, you’ll even see it in shows like Maria-sama ga Miteru. So I hold much respect for Super Sentai, for being what it is. They’re kids’ shows, but that’s no reason not to try. Try to watch it, try to make it, try again.